Lehmann Maupin is pleased to announce a major solo exhibition of Tony Oursler’s work at the PinchukArtCentre, Kiev, Ukraine, from 16 February to 21 April 2013. From his earliest video and installation works, the mutability of human nature has been the central theme of Tony Oursler’s work, fuelled by his fascination with the psyche and systems of belief. The resulting sculptures, videos and installations challenge the viewer’s preconceptions of humour, insanity, rationality, schizophrenia, and culturally constructed notions of good and evil. Formally, Oursler has developed a wide-ranging use of materials from resin, glass, fabric, steel, and found objects, which are kaleidoscopically overlaid with projection, light and sound, forming a unique embodiment of these themes. His work invites the viewer to question their relationship with mass (multi-)media, and ranges from an examination of television (and its surrounding structures) to a questioning of the psychological effects of digital communication tools such as mobile phones and the Internet. Projecting moving images onto objects, Oursler moves beyond traditional uses of media, such as cinema, television, and computers, and creates something akin to “living” sculptures. The scenarios he devises are often full of poetic and humorous performances, incorporating all manner of physical and auditory representations of the human form; one might encounter a ghostly, floating spectre, a dizzy ballerina, a naked crawler, or simply a disembodied limb. The works incorporate a spectrum of voices reflecting numerous performative and literary approaches, ranging from florid poetics, interior monologues, tortured fragments, and scientific jargon. The viewer is invited to complete the script as they move through the exhibition and confront open-ended, often existential constructs. 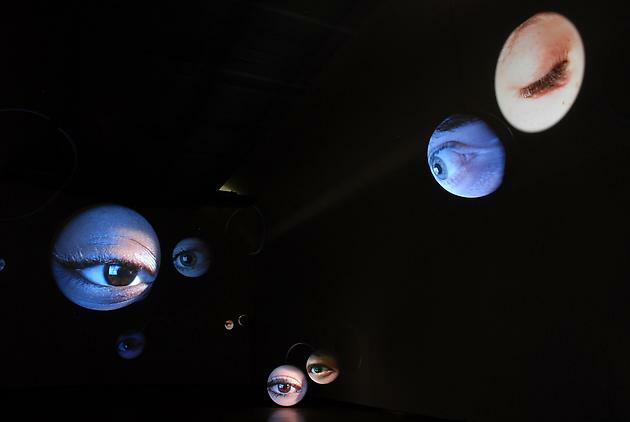 Among the works included in the exhibition is Eyes, which was first shown in 1996 and is one of Oursler’s most iconic works. For Oursler, the eye relates to not only the process of passively consuming pop culture, but also represents the origins of mimetic technology in the form of the camera obscura. Blinking eyes, which often reflect the screens they are watching, are projected each onto a sphere that, at times, has the same scale of the human body. The eye itself can be seen as a model for the system of perception but, at the same time, it also refers to mechanization and technology. The human face reoccurs as a subject in Caricatures, works in which biomorphic sculptural objects become caricature-like forms and are literally brought to life by video of eyes and moths that take over unnatural proportions of the sculptural object. Finally, the exhibition features a screening room of music-themed videos, including Oursler’s collaborations with Sonic Youth, Beck, Kim Gordon, Stephen Vitiello, Glenn Branca, and the recently released music video with David Bowie.